The 70-year-old man was brought into the accident and emergency department of Jackson Memorial Hospital intoxicated and unconscious when doctors discovered his chest tattoo, which read "do not resuscitate" (DNR). He was in septic shock due to an infection, which causes organ failure and extremely low blood pressure and his condition was worsening. The tattoo, signed off with what appeared to be the man's signature, opened up a barrage of legal and ethical questions. "We initially decided not to honor the tattoo, invoking the principle of not choosing an irreversible path when faced with uncertainty," wrote Gregory Holt, a critical-care physician in the New England Journal of Medicine. The team gave the man antibiotics, fluids and medication that helped stabilise his blood-pressure to give themselves more time, but struggled with whether they should hook him up to a life-support machine. Left conflicted, the staff requested an ethics consultation. After reviewing the case, it was deemed that the man's tattoo should be respected as "it was most reasonable to infer that the tattoo expressed an authentic preference". Holt explained that the staff were still left unsure, as it was possible the tattoo no longer represented his actual wishes and they had no way of asking him or his next of kin. 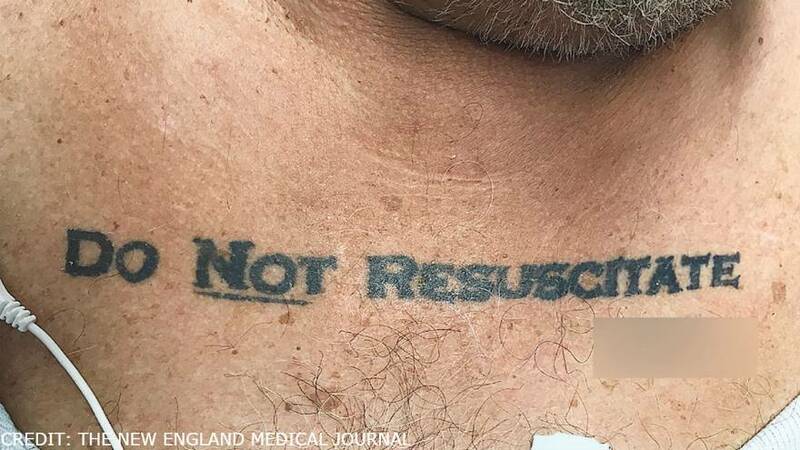 Doctors were relieved to find his written DNR request, especially when their review of the literature identified a case report of a person whose DNR tattoo did not reflect his current wishes. The patient died the following morning. "We need a better system for people to be able to convey their wishes - if these are their wishes - so that we don't do things to them that they don't want, like in the throes of an emergency when a man like this comes into the emergency room unconscious," said Holt.